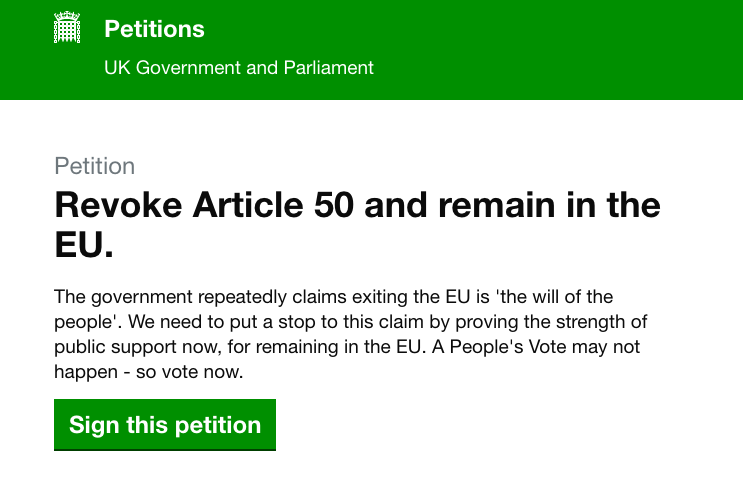 As the Revoke Article 50 petition hits 5 million signatures, I’ve been looking around for evidence of bigger petitions. So is it the biggest in UK campaigning history? Longer + caveated answer – I’ve not yet found any evidence of a petition that has had a bigger overall total, but it’s still got some way to go to top the Chartist who got a third of the adult population at the time to sign there petition in 1842 – for contrast the Article 50 petition is at approx. 10% of current adult population of 52,403,344. The 1842 Chartist Petition was signed by approximately one in three of the adult population – the logistics of achieving this are amazing. A Chartist Petition that was handed over in 1848 with a declared 5.75 million signatures, but upon counting the Commons Committee for Public Petitions found it to contain under 2 million signatures. Jubilee 2000 petition was signed by over 24 million globally. Reviewed the websites of platforms like 38 Degrees, Change.org and Avaaz, and talking to contacts who work with those organisations – while it’s possible to recall a number of petitions that have been set up on those sites which have reached towards a million – none have achieved the figures listed above. Between 1839 and 1843 more than 17,194 anti-corn law petitions were sent to the House of Commons, containing over 6.2 million signatures. Mary Whitehouse’s 1.35 million NVALA petition for public decency in 1973. In the 50 years before women gained the vote in 1918, almost 17,000 petitions for women’s suffrage were sent to the House of Commons, containing over 3.3m signatures. 800,000-strong petition was delivered to Parliament protesting about the sentence of the Tolpuddle Martyrs in 1834. Looked at the data from the three editions of Parliament Petition site (2010 to 2015 Coalition Government, 2015 to 2017 Conservative and current), which lists 1 other petition that has reached over a million signatures, the 2017 Prevent Donald Trump from making a State Visit to the United Kingdom. I’ve looked at what makes a ‘big’ petition on this site before. It’s also interesting to note that there are some campaigns which saw significant public protest – see here for a full list of biggest protest marches – like the 2 million people who marched against the Iraq War in 2003 but for which there is no evidence of a petition of a similar size set up at the same time. Please do use the comments section below to suggest other petitions that should be included – I’d love to put together a top 10.